Career & Business What is Paytm BHIM UPI and how to use it? Paytm has introduced BHIM UPI. Friends, UPI is the fastest easy and secure way to send money online to anyone, through this the payment is made directly to your bank account. To send and receive money from UPI, you have to create a unique virtual id called VPA (Virtual Payment Address). Now you can create your UPI ID through the Paytm app. Paytm UPI Id will be linked to your bank account. If your account is in any bank account you can link it to Paytm BHIM UPI. Let's see how to create a Paytm UPI ID. How to Create Paytm BHIM UPI ID? 1. First of all, log in to the Paytm app, click on the UPI option you will see on the screen. 2. You will now have the Link your Bank Account page open. From here you have selected your bank. Keep in mind that you can create UPI ID from registerd mobile number in the bank you are selecting. This means that, registerd mobile number in the bank and the phone you are using from the app should be same. 3. Now you have to enter your mobile number which is linked to the bank and it has to be verified. To verify the number, automatic send a message from your registerd number. 5. Along with VPA you also get a UPI QR code. You can share this code with anyone and the person can scan it and pay you. 6. After creating a UPI ID, you have to create a 4 or 6 digit MPIN or UPI PIN, which is to be entered during transaction. 7. To create a MPIN, you have to enter the option set upi pins and enter the details of your debit card and create your own PIN. 8. Just now you are ready to send and receive money to anyone through UPI. You can also send and receive money through UPI Id or bank account and IFSC code. Information about Paytm Bhim Upi you may have liked. 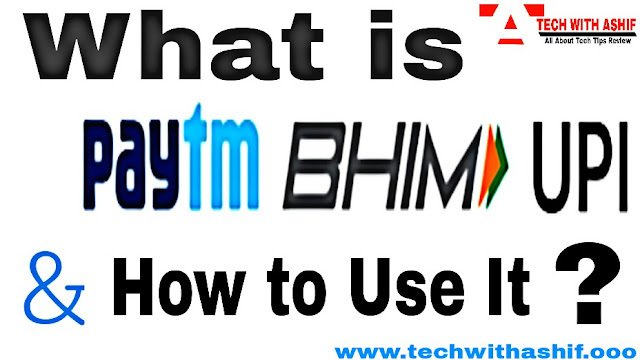 Now you may have known what is paytm bhim upi and how to use it. Please, You comment on your suggestion.